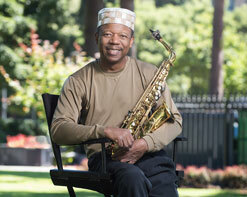 Kenney Polson started playing saxophone while attending public school in California. He began performing professionally at an early age. He has performed and visited over 50 countries. His fluent musical styles include jazz, Latin, classical, new age, rhythm & blues, funk, and gospel. On top of being a gifted performer, he is also a devoted educator. He’s taught everywhere from Fresno, CA, to Bogota & Rio de Janeiro, and ultimately the city he calls home now, Portland, OR. He has struck the perfect balance between imparting his knowledge on others while still being able learn something new each and every day. The culmination of his lifelong pursuit of music and knowledge is his new recording, Paradise Volume 1, available worldwide now from NMAP and KES Music and Video Distribution. The album is the perfect showcase of his chops, whether it be a solo effort or the multitude of collaborations with some of the biggest names in Brazilian jazz that he has befriended over the years. Possibly the smoothest of them all is the new single, “Babydoll,” and the delightful new video we bring you today. For “Babydoll,” Kenney breaks out his cherished, beautiful Selmer Mark VI alto (with the super rare low A!) and makes it sing like a heavenly chorus. The video follows the budding romance of a young couple and the evolution of a chance encounter in a full-blown symbol of love. At each turn and moment, Kenney is there to offer not only the perfect soundtrack but also a helpful nudge and encouragement to conquer the butterflies. The secret star of this video is the stunning natural beauty of Portland and the Pacific Northwest, all of which would create the perfect, most picturesque visual for screens all over. We do hope you’ll consider it for your programming, so please let us know what we can do to help make that happen. Please contact HIP Video Promo at (732)-613-1779, email us at info@HIPVideoPromo.com. You can also visit www.KESDistribution.com or www.KenneyPolson.com for more info on Kenney Polson.